Jason was born in Owensboro, KY, grew up in Hawesville and lived in Lewisport. He was a compassionate person that would help anyone. 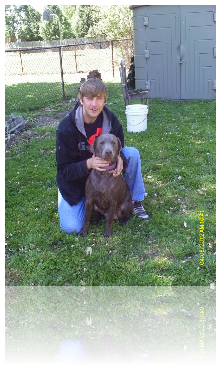 He loved his dog Hope and he enjoyed bowling and spending time with friends and family. He was also a farmhand. He is now in heaven playing Guitar Hero with our cousin Stephanie, farming with both Papaws, and listeing to Granny tell him to finish everything on his plate before getting up from the table. He was Jason to all the family and Cheeks to his friends. He is very missed by his mom, Deanna; dad, Jimmy; sisters, Jamie and Kay; a niece and nephew, Autumn and Connor; his brother-in-law, Ty; his grandmother, Anna; his dog Hope; and several cousins, aunts,uncles, and many friends. He had a lot of family than was not only by blood. Jason lost his eye in October of 2010 to Ocular Melanoma and we thought it was all gone. But we were wrong, it had been growing for a long time before it was caught in his liver. He was able to live life by not knowing he had cancer, since there was no cure for it even if it was caught early. He was able to farm, bowl, go to church, and spend time with his family and friends. He wanted to fight it, but his body was not strong enough to keep up with his willpower. Tuesday, Feb. 12 3pm-8pm CST and Wednesday 7am-12:30pm at Gibson and Son Funeral Home in Hawesville, KY.
Funeral is Wednesday Feb. 13 at 1pm at Hancock Christian Church in Lewisport, KY with burial at Union Baptist Church in Hawesville, KY. There will be a meal afterwards for family and friends at Central Baptist Church in Hawesville. Please donate to the Ocular Melanoma Foundation in memory of Jason.